The Next Generation Composite Wing (NGCW) project is a £100M initiative led by Airbus to revolutionize aircraft wings in order to design, manufacture and test significantly lighter-weight and more eco-efficient aircraft. 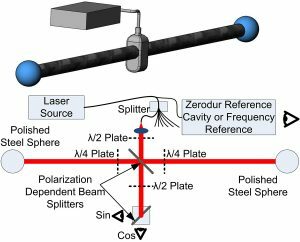 Jody Muelaner led a review of Large Volume Metrology Instruments covering instruments providing sub millimeter measurement capabilities at scales of greater than 1 meter and typically in excess of 10 meters. 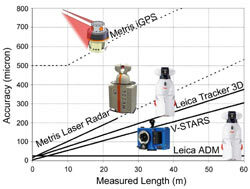 These systems combine laser ranging with two angle measurements to give coordinate measurements in 3 dimensions, such instruments include laser trackers and laser radar. The best state-of-the-art systems available (using multi-lateration) can achieve accuracy of 1 part in 106 of the measured range although 1 part in 105 is typical for coordinate measurements. Photogrammetry is essentially a theodolite network with cameras serving as automatic theodolites. Once a target has been located on a two dimensional image the direction of the target can then be determined from trigonometry. A major advantage of photogrammetry is that many points can be measured simultaneously. Accuracies of 1 part in 105 are typical. Indoor GPS (iGPS) uses a number of transmitters around the working volume to fix the position of a single sensor. Communication from transmitter to sensor is one-way, so it is possible to have a large number of sensors simultaneously receiving signals and detecting their position. Accuracies of a few parts in 104 are typical. A point of laser light is rastered across an object to project templates and instructions for composite layup, painting, fitting bracketry etc. 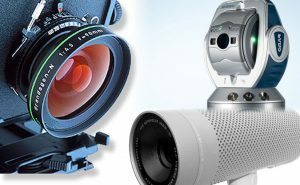 The laser projector is supplied with data describing the profiles to be projected, surfaces to project onto and reference features such as holes or corners. 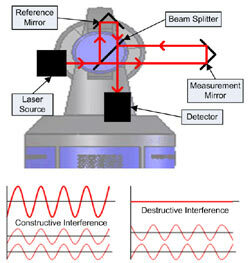 An integrated laser line scanner measures the reference features allowing the system to locate its-self within the virtual CAD environment before projection is carried out.